When should I fertilise my lawn? Like anything else organic, your Sir Walter lawn will always do best when it is being well looked after. 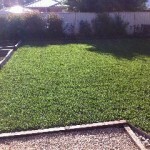 Fertiliser is a great way of keeping your lawn in good shape and it’s simple to apply and effective in all conditions. It’s crucial to fertilise regularly to keep your lawn at its healthiest to deal with changes in temperature and any other problems that nature throws at it. To keep your Sir Walter in peak condition you will need regular applications of fertiliser. Healthy deep rooted lawns are better equipped to deal with stress, maintain their winter colour and prevent the germination of weeds. When laying you should always use a starter fertiliser such as Sir Launcher, then approximately 6-8 weeks after installation we recommend using Sir Walter Premium Lawn Food at 25grams per square metre. Then as an ongoing guide, fertilise your lawn with Sir Walter Lawn Food at the start of spring, middle of summer and autumn.When it is raining it is the perfect opportunity to get out your Sir Walter fertiliser, because you don’t have to water it in, you are saving water and your grass will love you for it! You can spread by hand or with a fertiliser spreader. As a benchmark feed one small section of about 1 square metre with twice the amount that you apply to the rest of your lawn and water that in well too. If the rest of your lawn looses colour and this area retains its colour, it is telling you that it is time to feed again.So don’t forget regular applications of Sir Walter Premium Lawn Food will give you a nice healthy lawn all year round. The preparation for your new lawn is just as important as the installation and crucial to its success. Always spray the area with a weed killer such as Glypho 360 to remove any unwanted weeds, vegetation or an existing lawn and remember always follow the instructions. Digging out existing grasses is not always a good way to kill them as some roots can go down over a metre. If your soil is not ideal and you need to improve the structure, cultivate with Gypsum organic matter for clay soils and plenty of organic matter for sandy soils before spreading a 100mm layer of turf underlay soil mix. For more specific advice do not hesitate to contact us 1300 554 442 – or ask us a question on our Facebook page. If you have a 150mm of good soil already there is no need to bring in any new soil, just cultivate with a rotary hoe or by hand. In some situations you may want to bring in a layer of turf underlay soil mix, just to help you fine tune those levels before putting the turf down. Calculating how much soil you will need is fairly easy. For a depth of 100m you will need 1 cubic metre per 10spm and spreading is simple. Once your soil has been cultivated and you have spread your turf underlay soil mix, it’s a great idea to add some Sir Launcher which really helps get your lawn started and established. Mix whatever you have added into the top 75mm, level it out and you are ready to go. Now one of the things that can happen to many lawns is the root zone dries out the lawn gets hungry and really starts to struggle. And for us the lawn owner we either think it’s all too hard and simply give up or go and spend a heap of money on the wrong products. A few years ago Sir Walter launched a starter fertiliser called Sir Launcher. Sir Launcher is full of the best fertilisers and water storage crystals. The only thing is it’s designed to go on before you install your new lawn, so it doesn’t really work for existing lawn. But that problem has been solved thanks to the Lawn Lovers Range. Lawn Rescue is an easy-to-use, clip on hose pack that contains no nasty chemicals and what Sir Launcher does to new lawns, Lawn Rescue will do to existing lawns. Lawn Rescue is an effective starter fertiliser designed for the development of root systems and early turf growth, specifically developed to stimulate support and protect new root growth in turf while optimising water availability to the plant. It contains all the vital nutrients like nitrogen, potassium and phosphorous. It also contains organic seaweed kelp and polycrylamide water storage technology to keep the water in the root zone where the plant most needs it. Is sandy soil a problem for your lawn? Sir Walter Lawn Soaker is a new soil wetting agent that has been developed for lawns laid on sandy bases. In this video Nigel Ruck explains how this product improves water penetration to the root layer of your lawn. Gypsum, also known as calcium sulphate helps to break down and open up a clay soil allowing water, nutrients, air and lawn roots to penetrate into the soil more easily which is exactly what you want. Now if you’ve got a clay soil it’s best to incorporate the gypsum into the soil before you spread your turf underlay mix. You can do this with a rotary hoe or you could just use a mattock for small areas. For an existing lawn use a garden fork, push it in while moving it back and forth. Broadcast the required amount of lime over the area and water it into the soil. Now sometimes you lawn will get damaged from general wear and tear from pets or high traffic and even cold weather. Gypsum will help repair these areas. Now always read the instructions on the bag buy as a general rule for light clay soils you need to apply 1 kg per square metre and for heavy clay soils you double it to 2 kg per square metre. And remember this too, gypsum is pH neutral, if you want to raise your soils pH you need to apply lime or dolomite. I’d like to introduce my new book, Loving your Lawn, your guide to the perfect aussie lawn. Created with the collective knowledge of 66 of the leading Australian Turf Growers, this book enables people throughout Australia to select, lay and maintain a lawn to suit their unique situation. Published by Green Propeller and written by myself, this comprehensive lawn guide is a collaborative work. It’s the first book of its kind – aimed directly at all Australian lawn lovers and their lawns. Loving your Lawn combines the practical and localised knowledge of turf farmers across Australia with my hands-on knowledge and practical skills in both lawn and landscaping in general. Green Propeller’s creative, editorial and marketing team have crafted this knowledge into a unique fusion of how-to guides, practical information and outstanding photography — a book worthy of any coffee table, or lawn enthusiasts book shelf. Sometimes you may find your lawn is not performing very well or not responding to fertiliser and this could be to do with the soils pH. Now pH is a measure of acidity and alkalinity and Sir Walter lawns like to be in the 6 to 7.5 range for optimum performance. A pH in the right range of 6 to 7.5 is a bit like a plant with its mouth wide open, no food will go to waste here and it will all be eaten by the plant. Adjusting the pH is easier on loamy and sandy soils than on heavy clays. If your soil is a sandy loam and you need to raise the soil pH by one unit add the equivalent of 150g of liming material per square metre. An adult handful is about 100g. Heavy clay soils will require at least 250g to raise the pH by one unit. A super fine grade of lime works quickest and generally costs around $8 a bag. For an established lawn, which may be lacking magnesium, mix 50/50 lime and dolomite as the liming material to get the right balance of calcium and magnesium. Dolomite is only available in one grade and costs around $8 a bag. After applying lime or dolomite make sure you water them well so that it moves into the soil. Testing the soil’s pH may seem like some mad scientific operation but it couldn’t be simpler with one of the soil pH test kits. All you have to do is follow the instructions and it even tells you how to make the changes. You can get all the lawn care products you will need here at our online Lawnstore. Now this is an excellent question, and it is part of your lawn’s survival mechanism in response to change, say sudden hot weather or lots of rain. Now if your lawn is only going to seed during these sudden changes then you have nothing to worry about. But if your lawn is constantly in seed then you probably have some issues with your soil and you need to take some remedial action such as fertilising and top dressing to really beef up that lawn again. On this video out at the Turf farm you can see a really good example of this with two sections side by side. The first section has recently been fertilised and it is beautiful, lush and green. The second section is exactly the same lawn but hasn’t been fertilised, it is a lighter colour and has gone to seed. You get some good fertiliser on the second section and it will be lush and green and seedless just like the Sir Walter next door. In the Sir Walter video Tim Shaw talks about Sir Launcher, the ultimate starter fertiliser to be applied prior to laying your lawn. Sir Walter the flood resistant lawn! Loving your lawn, your guide to the perfect Aussie Lawn is a unique lawn care guide written by Nigel Ruck. This 126 page lawn care guide is packed full of interesting and useful articles and DIY guides to help you achieve the perfect lawn.